Golden Glow capsule is an outstanding ayurvedic treatment for acne and pimples that cleanses blood, prevents skin disorders, and improves natural glow of skin. Acne is one of the commonest skin problems which people of all age-groups can face. These are tiny bumps on skin which can occur in bulk or singularly and make skin rough and spotted if not controlled. Golden Glow capsules are Ayurvedic treatment for acne. There is little effect on the problem of acne when it is treated from outside, most number of causes of this problem lie inside the body, Golden Glow capsules provide ayurvedic treatment for acne which handles the problem from inside and shows long-lasting results. This ayurvedic treatment for acne improves skin’s health and ability to prevent bacterial infections to curb acne. Due to hormonal changes, diet and other conditions sebaceous glands lying beneath skin in its pores become overactive and release sebum in higher quantity. Due to lack of nutrition, reduced blood flow and poor skin health skin pores get blocked by dead cells which cause sebum build-up beneath skin. When this accumulated sebum gets infected by bacteria it forms a pustule called as pimple. Golden Glow capsules resolve all these conditions by providing holistic ayurvedic treatment for acne. The herbal ingredients of Golden Glow capsules promote higher blood flow in capillaries of skin and supply more nutrition; these also control over-activity of sebaceous glands, and keep skin pores open to allow sebum to flow out. This ayurvedic treatment for acne also curbs bacterial presence on skin and prevent infections. This ayurvedic treatment for acne also possesses anti-inflammatory herbs which allow immune system to reach pimples and heal them faster. These pills also possess herbs to maintain healthy production of connective tissues to keep skin tight and prevent formation of scars and patches over skin due to acne. This ayurvedic treatment for acne removes toxins from blood by keeping liver functions higher and digestive system clean. These ensure regular removal of waste matter and prevent problems like indigestion and constipation which also trigger acne. Golden Glow capsules are the best herbal pills for pimples as these improve skin’s tone by reducing dark spots and marks. These diffuse melanin secretion and regenerate skin cells at faster pace to replace rough, damaged and cells with higher melanin with fresh and new ones to provide skin brighter shade, even tone and suppleness. These herbal acne pills can relieve the problem of acne even if caused by genetic reasons and remove acne marks and scars in a short time. These herbal pills for acne possess curative and preventive properties and curb outbreak of acne in future. Apart from acne these herbal pills for pimples are effective in treating other types of skin conditions like eczema, urticarial, rosacea etc. as well effectively. Golden Glow capsules are fit and safe to be used by men and women of all ages. These are purely herbal and contain no artificial compound or substance. This ayurvedic treatment for acne can be used to gain younger looking shiny and glowing skin without any medical prescription. Due to their wide ranging benefits these are reckoned as the best herbal acne pills. 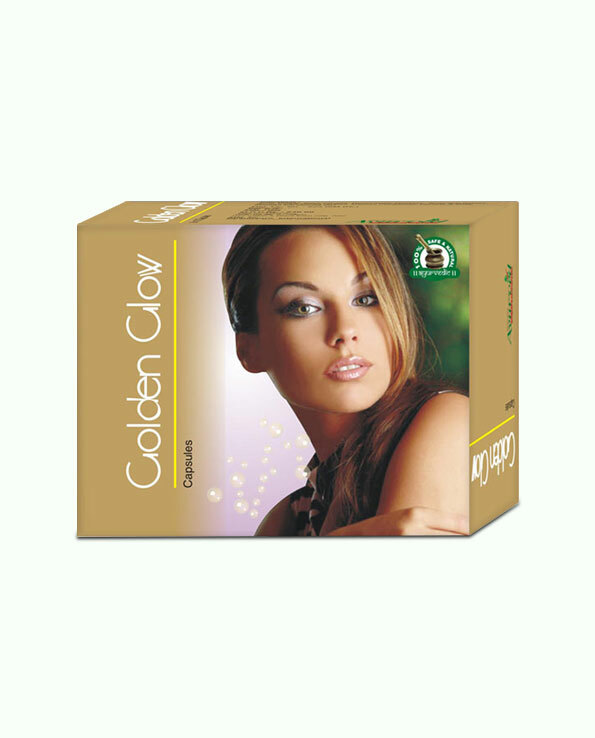 Golden Glow capsules possess ingredients which are – Neem, Haritaki, Haldi, Tulsi, Gulab, Manjishtha, Javpatri, Jaiphal, Kut, Kesar, Shwetbeej, Nisont, Giloy, Kamal, Ankol, Jatamansi, Guladaudi and Moti. All these herbs by their collective effects heal and prevent acne, remove skin blemishes and provide shinier and smoother skin. Consume one or two pills of Golden Glow capsules with water or milk twice in a day after breakfast and dinner. Maintain regularity and avoid misses to gain faster results. Duration of course depends upon severity of the problem. In case of severe acne continue this treatment for 6 months, but in moderate condition these pills can provide complete relief within 4 months of use. Eat high fibre diet low on fat. Drink plenty of water and avoid coffee and beverages which slow down metabolism. Drink healthy drinks like fruit juices and green tea and keep skin clean. For your convenience we offer you few easy to use modes of payments. You can pay us through cheque, DD or deposit cash in our account. We also accept payments through NEFT and you can avail our COD facility in India. How do you ship Golden Glow? Within how many days will I receive these acne pills? Your privacy will be maintained right from order till delivery. You will get your order packed with a plain paper which will give-out no details about the product and its uses. We deliver within 3 to 5 working days anywhere in India through FedEx. I had tried many products for acne problem but none of them worked. After that I had started using Golden Glow capsules. Within 3 months I had seen drastic change, my acne marks disappeared. I am really amazed with these supplements. Quite effective and helpful to prevent acne and pimples problem from the root!! EXCELLENT!! Face gets natural glow after using these supplements. Fast result!! Feel fresh and beautiful. I’ve been using these supplements for quite some time. It’s a good product to cure skin disorders. I would absolutely recommend it. Amazing product!! Justify its name. Makes skin glowing and youthful!! Yes, it works for all skin types. This is my trusted brand, it is natural what I always wanted to. Many positive changes seen on my face after taking this supplement. I am a 30-year old with a hectic field job that makes me stay in the sun for long periods. My skin is now so tanned. Will this product help my skin go back to fairer complexion? Yes but to obtain better result it is suggested to take these pills along with regular use of Chandra Prabha ubtan and Aloe Vera gel.